A few years ago, I bought a PC game called Creatures 2. I played it, and it was an average management, tamigotchi esque game. 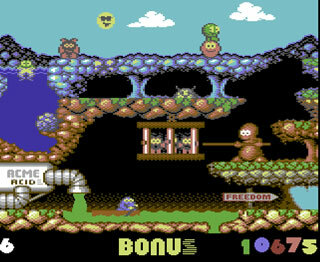 Everybody raved about it, and I’m sure it was a great game, however it isn’t my style of game, it isn’t the geniusily funny and grusome Commodore 64 game. Released in 1992 by Thalamus towards the end of the Commodore 64 lifespan. Creatures 2: Torture Trouble (or to give it is full title Clyde Radcliffe Exterminates All The Unfriendly Repulsive Earth-ridden Slime 2: Torture Trouble) is a game for the Commodore 64. Unsurprisingly, it’s the sequel to the original Creatures, which caused much farore in the C64 world with hugely polarising reviews. Zzap 64!, who gave a hugely positive review, was lambasted by other magazines pretty much because their review was based on the fact that Thalamus gave them huge design features throughout the production, hence that swung into a positive review. There was one aspect of the game that was unanimously loved – the torture screens. The first game consisted of a side scrolling game, followed by these torture screens. These involved rescuing one of your kids from a gruesome death in a Rube Goldberg style machine. The machines require a little bit of planning to overcome, but are fairly straightforward. Fail however and you’ll see one of your children die in a grotesque manner. The side scrolling sections of the game sucked, but the Torture screens stood out as awesome, so these became the basis of Creatures 2. However, I will say this, I got frustrated with the rescue screens! 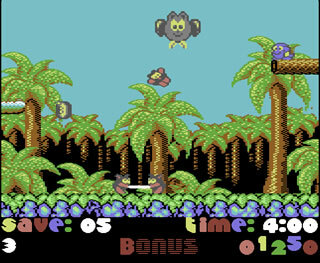 The torture screens were increased from three to 6 (Clyde obviously had been busy in between games), and inbetween them was a sub game which involves bouncing the fuzzy wuzzies (the official name of Clyde’s species) from one side of the screen to the other. Following that is the three boss screens & a transportation section where you have to transport all the rescued Fuzzy Wuzzies from one island to another. Overall it breaks up the game nicely. This is a fantastic game, the torture screens stand out as being creative, well thought out, and beatable. The intermissions are fun, if a little tricky. The bosses are great, and the island hopping is fun. The game also has a great sick sense of humour with plenty of C64 gore, but not enough to cause outrage in the newspapers. The graphics are bright and colourful the music is incredibly catchy, and the game is very well made. All in all, a great game, and much better than the PC game that shares the same name!